Introduce your kids to different types of nouns with the help of ‘Concrete and Abstract Nouns’ – a fun grammar worksheet for fourth grade. By the time kids have graduated to the 4th grade, it isn’t enough to just be able to identify nouns; kids are expected to be able to tell the difference between the different types of nouns too! 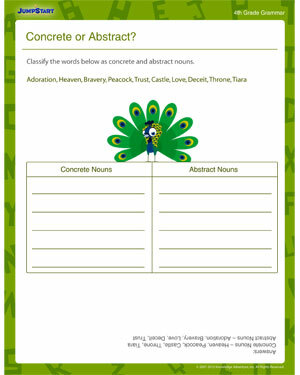 Teach your kids all there is to know about concrete nouns (nouns that name people, place, things and have real existence) as well as abstract nouns (nouns that name concepts, ideas and emotions) with this exciting 4th grade noun worksheet! Also check our other 4th grade English worksheets.